Hacking Tutorials first started in June 2015 with the first few hacking tutorials about WiFi hacking and some general hacking tutorials. Since than we’ve expanded the tutorial section with Websploit & Metasploit tutorials, basic scanning tutorials with Nmap and the latest series of tutorials is covering the basics of malware analysis. At this time we’re planning Hacking Tutorials 2016 where we will also be covering more advanced subjects in depth in the field of ethical hacking, penetration testing, malware analysis and programming for hackers. Of course we will be expanding the basic tutorial sections also for those who just started out learning about ethical hacking and penetration testing. The current planning for Hacking Tutorials 2016 is focused on expanding our knowledge with more advanced and in depth Hacking Tutorials. We will shift the main focus from basic hacking tutorials to more advanced hacking tutorials. Basic tutorials are focused on how to use hacking tools and the advanced hacking tutorials will focus on how do hacking tools work and how can I write my own tools, scripts and modules. Of course we will build this knowledge from the ground up with some basic tutorials, for example with a Basic Python course and how to write your own Websploit and Metasploit Modules. Last but not least, we will be reviewing some Udemy Hacking Courses in February, you can read more about this here. 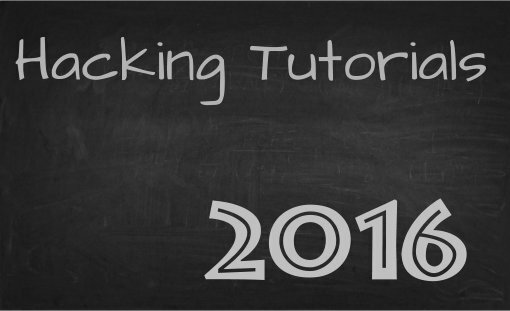 Let us know if you have certain requests for specific hacking tutorials or subjects to cover 2016. Please leave a message in the comment section, drop us an e-mail or contact us on Twitter, Facebook or Google+. Thank you for reading and see you back on Hacking Tutorials in 2016!